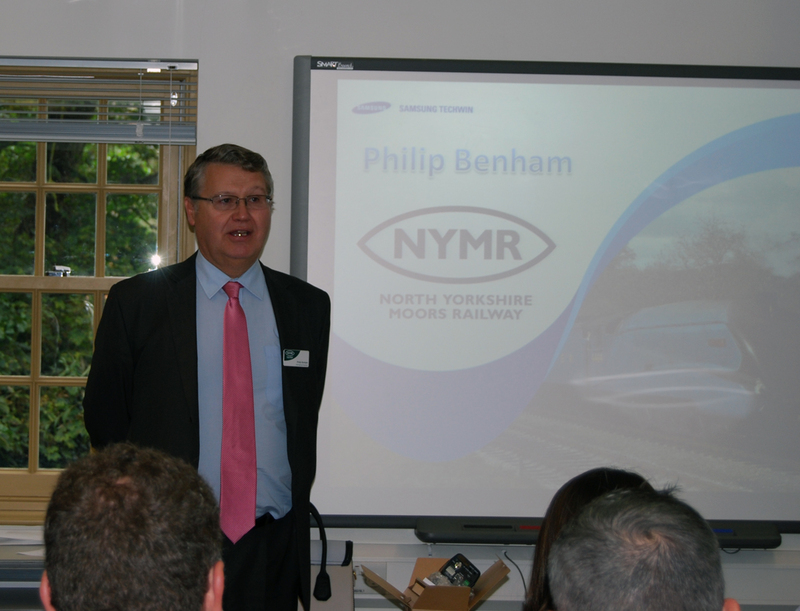 Industry professionals from across the UK recently attended a Samsung Techwin seminar held at Pickering Station (part of the North Yorkshire Moors Railway) to learn about the latest open platform video surveillance technology now available to the rail sector. Brian Sims reports. All delegates attending on the day are involved in the railway sector’s supply chain and were thus the perfect audience for the formal announcement that Samsung Techwin Europe’s cameras, domes, recorders and Ethernet switches forming its complete IP network video surveillance range have been approved for use within Network Rail’s infrastructure. The PADS Certificate of Acceptance follows a process during which the Samsung Techwin Europe video surveillance products were evaluated and comprehensively tested to ensure that they’re wholly reliable, fit for purpose and duly comply with Network Rail’s demanding standards in respect of safety issues. Simon Shawley (director for Northern Europe at the Security Solutions division of Samsung Techwin Europe) proudly told members of the audience that obtaining PADS approval represents a significant landmark for the business. Among the products approved by Network Rail are Samsung Techwin’s open platform WiseNetIII HD megapixel cameras. These offer end users the option of running multiple applications such as video analytics, facial recognition, people counting and ANPR which can be downloaded to cameras in a similar way that you would add Apps to a smart phone. Importantly, the PADS Certificate of Acceptance issued by Network Rail also provides approval for a number of Samsung Techwin’s analogue cameras and DVRs. The Samsung Techwin seminar was conducted inside the Learning Centre at Pickering Station. This is the flagship station and headquarters of the North Yorkshire Moors Railway which last year celebrated its 40th Anniversary as a fully operational heritage railway. The railway was formed in 1967 when founder members met with the aim of reopening the Grosmont to Pickering line both as a tourist steam railway and to preserve the rail link to Goathland, the roads to which were prone to being blocked by snow during winter months. Today, the North Yorkshire Moors Railway carries around a third of a million passengers each year and operates on 270 days of every year, running between eight and 20 trains per day while relying on over 400 volunteers and more than 100 paid staff to maintain the service. 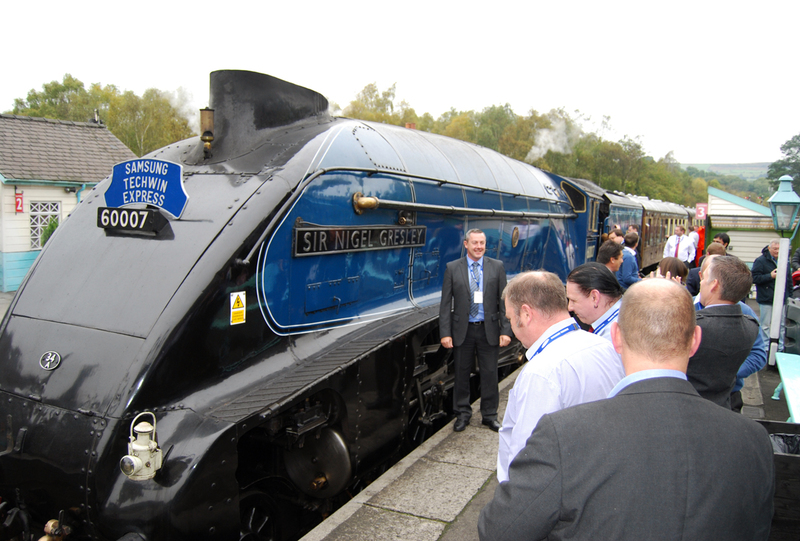 After a brief presentation on the railway by Philip Benham (general manager of North Yorkshire Moors Railway), who explained the history of the railway and its plans for the future, attendees had the opportunity to network with colleagues before preparing to board the ‘Samsung Techwin Express’ which departed from Pickering Station for a return journey to Grosmont through the picturesque Yorkshire countryside. Travelling with the aid of the A4 class locomotive Sir Nigel Gresley is a rare opportunity. This is one of only a small number of working models in the world. The train is the sister to the Mallard which, back in 1938, achieved a speed of 126 mph and, in so doing, set a world speed record which still stands today. Keeping steam locomotives on the rails comes at a hefty price, not to mention the other areas of maintenance and restoration on the railway that relies so heavily on public donations. With this is mind, attendees were invited to provide a donation as a ‘Thank You’ to the North Yorkshire Moors Railway for helping organise such a brilliant day. Over £700 was raised. 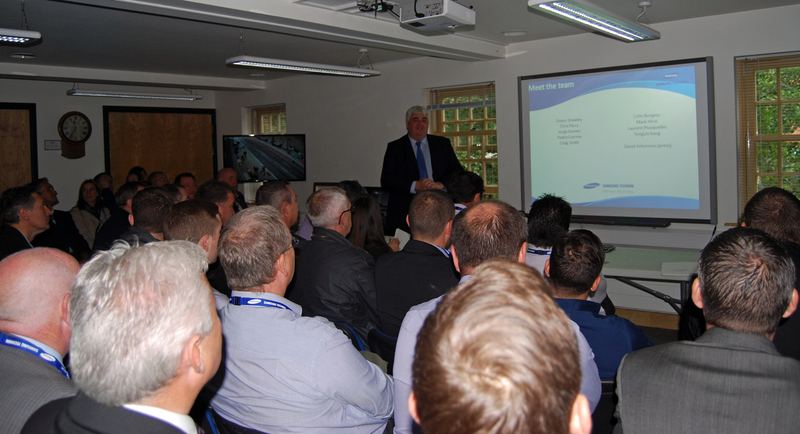 Pickering Station proved to be the perfect venue for the seminar and for Samsung Techwin to be able to demonstrate how the latest generation of HD cameras can cope with the demanding conditions often experienced at railway stations and on board trains. 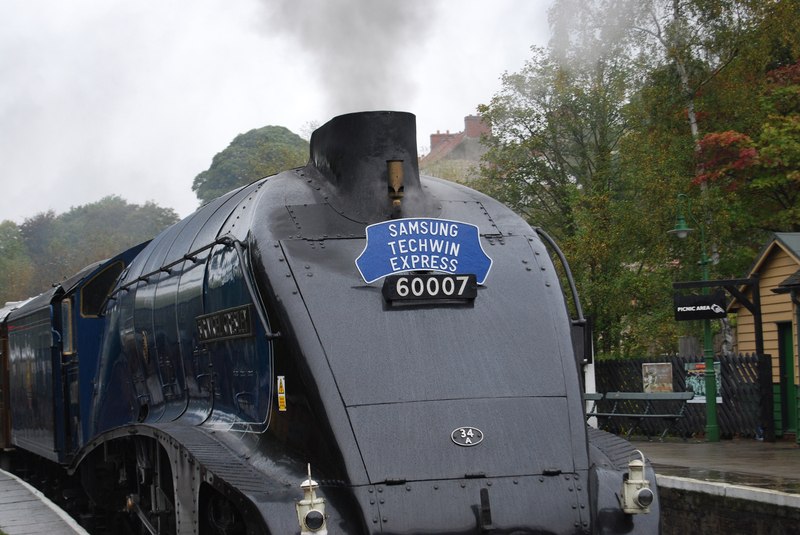 Samsung Techwin’s WiseNetIII cameras and domes had previously been installed on the platforms of Pickering Station as part of an overall programme of improving security for North Yorkshire Moors Railway’s facilities following a major theft last year which saw the loss of valuable steam engine parts. Benham and his colleagues considered proposals from a number of manufacturers but, following an onsite demonstration, decided to single-source all of the required security cameras and video recording equipment from Samsung Techwin. “Apart from the fact that they work within the rail sector, many of our guests are train enthusiasts and so we’re delighted that they were able to enjoy their time on the Samsung Techwin Express,” said Diane Cooper, head of business development management at Samsung Techwin Europe for the UK, Ireland, Benelux countries and the Nordics.